Hi, friends!! So, we are almost hitting the five month mark and I got to thinking about the last list of essentials that I posted and the list of items we use everyday has COMPLETELY changed. 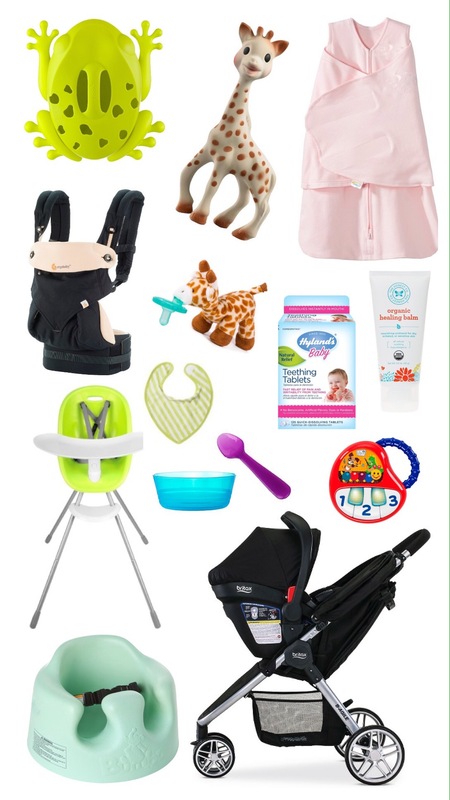 Baby girl is growing so much and while there are a few staples that we continue to use, she has outgrown some of those items and then we have also added lots to her daily routine, so I figured it was time for a new list of essentials! While we still use the 4moms bathtub, E is rapidly outgrowing it. As soon as she can really sit up on her own (she’s close!) we will probably move to a laundry basket just to keep her steady and keep her toys close! Speaking of toys. All of a sudden, she loves them. She went from zero interest to give me ALL of the toys overnight. At bathtime when I was growing up, I think my parents just kept them all in a plastic bin under the sink. Boon has invented this sweet frog bathscoop that attaches to the wall and acts as a scoop for your toys. When you reattach it to the wall, the toys can drip dry until the next bath–no more moldy toys! What will they think of next?! Not much has changed in this department, other than the fact that I am still OBSESSED with this Healing Balm. Put in on everything. Eleanor loves Sophie and loves the Peekaboo Sophie book. She also has the little Sophie Teething Ring. Oops. Maybe Mama loves Sophie. Anything that makes noise is also a favorite around here, including this Baby Einstein Piano. Giraffe Wubbanub. E hasn’t quite decided if she likes the actual pacifier part, but she loves chewing on the sides of the pacifier and it’s easy for her to bring to her mouth. I especially love this for when we are in the car. It is impossible (and not safe) to put her pacifier back in while I am driving. This allows her to pacify herself when I cannot help her. E now sits in the main part of her stroller and loves it! Now with the great weather, we use it almost everyday! E outgrew the last swaddles that we had, so I grabbed The Halo Sleepsack and we LOVE it. It keeps her so warm without the risk of all the blankets because she is definitely moving around more. Speaking of which, we have a roller! She loves doing it at all times now, so we now have to do arms out. This swaddle is easy adaptable for all stages and I don’t have to worry! Seems sweet E is teething on top of the new rolling gig. So, after bottles and before bed, we’ve been giving her Teething Tablets. They really do work. For me, unless she truly needs it, I try to avoid Tylenol. These tablets have worked pretty well. About a month ago, we busted out the Ergo. It is perfect for on the go naps. Matt was super excited for her to be big enough to get in it (we didn’t know there was an infant insert) because it meant he could carry her around when we run errands because he refused to use my adorable Solly wrap (which I love). E still has all of her bottles and is eating like a beast, but showed all the signs that she was ready for solids and we got the go ahead to try some rice cereal. Well, she devoured it. We have made it a part of her nightly routine; a little rice cereal before bath. We love this bowl and spoon combo. Playing with them afterward is her favorite part. She’s almost at the point of feeding herself. It’s unreal guys. We started by feeding her in the bumbo with tray and now we have also tried her highchair. Both work great! The highchair is really great for me to put her in when I get home from work so that I can wash bottles and unpack from the day with her nearby. We’ve started a really fun game where I put toys on her tray and she throws every. single. one of them off and laughs when I pick them up. Super fun. Bibs. I kept thinking, when do I need these things?? Well, now, now is when we need them, rice cereal gets everywhere. These are really soft and not as scratchy as other options! What are some items that your little one loved at this age? Anything I should prepare for the next stage? Here are a few of my favorites from Eleanor’s newborn photo session. I am so so glad we had these taken. We did not do a formal maternity session, mostly because we are super super awkward photo people (please ignore my monster feet), but knew we needed to capture our first moments with our sweet little one. These photos were taken by the super talented Heather Arnita. She not only helped us feel very comfortable, she also graciously ignored and photographed around our disaster of a house. We are so very thankful to her for capturing our first formal pictures as a family of three! !